In 1948, Dorothy F. Bullitt bought a television station and renamed it KING to create the first TV station west of the Mississippi and north of San Francisco. 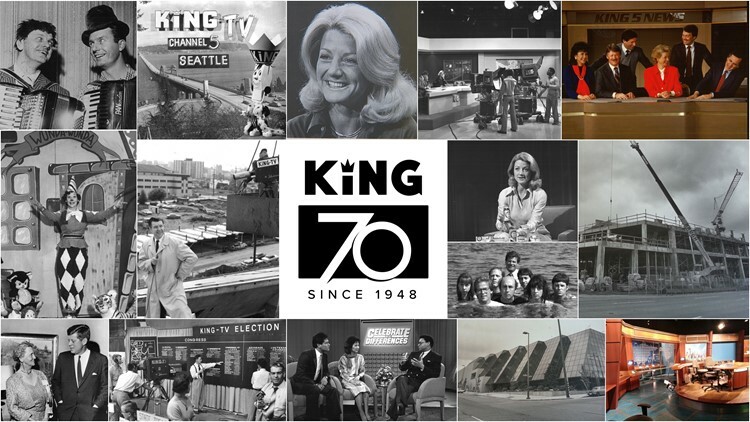 Seventy years later, KING 5 remains an innovator. Dorothy Bullitt, a local business woman, broadcast pioneer, and visionary, bought the station eight months after its debut in 1948, changing "Channel 5" to the call letters KING. As the use of television by audiences quickly grew, KING emerged as a station with a reputation of excellence, setting the standard for stations across the country. KING was the first television station north of San Francisco and west of the Mississippi, the first station west of the Rockies to telecast in color (July 1, 1954), and the first independent station to bounce signals off a satellite (1965). Over the past seven decades the station has been awarded with some of journalism’s highest honors, among them multiple Alfred I. DuPont-Columbia Awards, the George Foster Peabody Award, the National Association of Broadcasters Service to America Award, and multiple national Edward R. Murrow Awards. Over the next month, viewers will have the opportunity to join KING 5 anchors Lori Matsukawa and Joyce Taylor as they revisit the station’s history and bring to light memories that tell the story of KING 5’s community-minded brand of local journalism. “I can’t believe I’ve worked here for half the station’s lifetime! The theme that keeps emerging through the years is KING 5 has never stopped innovating and serving the community,” said KING 5 Evening News Anchor Lori Matsukawa. When asked about the milestone, KING 5 Morning News Anchor Joyce Taylor said "I think of the powerful, brilliant, visionary women and men who paved the way for me and so many others. Founder Dorothy Bullitt and so many other role models were the best of examples of what it means to be a journalist and community servant. I still remember the first day I walked the halls of KING 5 in 1988. Thirty years later, I am privileged to be a member of this team and one of the guardians of its legacy." Beginning November 7, special segments will air weekly in morning and evening newscasts, culminating with a one-hour special airing on Sunday, November 25 after The 5th Quarter. Segments and the special will include interviews with some of the station’s most beloved storytellers and influencers, including Founder Dorothy Bullitt’s granddaughter, Dorothy C. Bullitt, former Anchor Jean Enersen, former Anchor Dennis Bounds, and more.